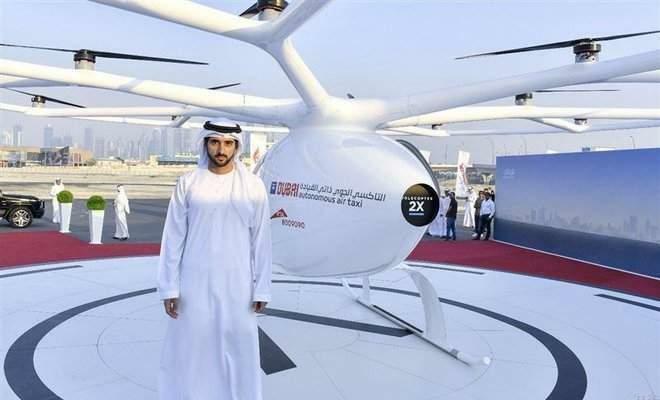 Dubai’s Crown Prince, Sheikh Hamdan, has attended the maiden flight of the world’s first self-flying taxi, but it will be at least another five years before it goes into public use. Provided by Germany-based Volocopter, the two-seater Autonomous Air Taxi (AAT) is being introduced by Dubai’s Road and Transport Authority (RTA), it can carry two people without a human pilot. During the ceremony, Sheikh Hamdan launched the first AAT into the sky with the press of a button. “After the remarkable success of the first driverless metro in the region, we are glad to witness today the test flight of the Autonomous Air Taxi,” Sheikh Hamdan said at Monday’s test flight.